Satoru lament that it is difficult for an ex-convict like him to find a job and be accepted back to the society. Asahi felt that he have not tried hard enough. The siblings did not express objection knowing that Satoru is living off the family expenses. They have accepted the fact that Satoru will continue to laze around. Conflicts arises when Satoru and Asahi clashed with their moral belief. Satoru accused Asahi for a hiding a bitter secret which caused him to leave the family ten years ago. Asahi told Saturo to leave the house if he felt so terrible, however Satoru declared that the house was left behind by their father and he has the right to live here. Asahi looked for Azura at the eatery store during lunch time. It will be Asahi first family visit and he is going to announced Azura pregnancy to her mother. They were feeling nervous about it and tried to rehearse their speech beforehand. Suddenly, Asahi's boss appeared in the store and tried to make small talk with Azura. On the other hand, Asahi tried to avoid him but was still spotted by the sharp eyes boss. He asked about Satoru and Asahi revealed that his brother knew about their father incident ten years ago and that was the reason why he left home. The boss looked surprised with a tinge of guilt on his face. 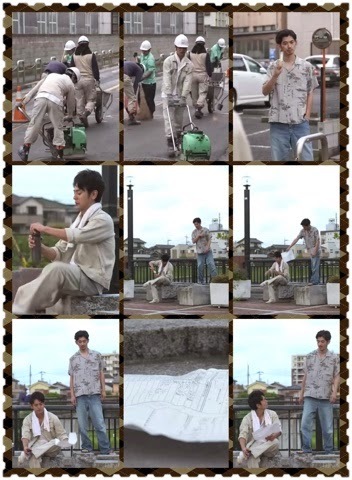 He offered Asahi to bring Satoru to work at the construction site too. Satoru continued to kill time while playing arcade games. A mysterious woman sat beside him and it turnout to be Takako. She offered him a job at the field but he declined the offer. He stated that Takako was just trying to make up her for a mistake to her decreased mother. Not about to give up, Takako passed him a name card and tell him to reconsider. Haru was trying to recruit Kasumi into his threate acting club. Tadashi was initially puzzled about his brother decision to scout for talent in a girl that deceived him. However, he was just as amazed as the other cast members when he saw her audition for the lead actress role. Everyone applauded her effortless performance and delivery of the script. Asahi paid a visit to Azura's mother house to asked for blessing. As expected, her mother have doubts about their future as a couple. Despite, Asahi reassurance that they will be happy, her mother was still not convinced, stating that the couple will face a tough road ahead of them. Hikari is still going out with Masaomi and they were photographed dating together. It was Satoru who took their picture and he showed animosity towards Masaomi. There seem to be another hidden secret between the two of them. Satoru adviced Hikari not to go out with a bad person. Satoru continued to idled around and refused to find a proper job. Asahi received a call from the restaurant that his brother had apparently ate the foods without money to pay. 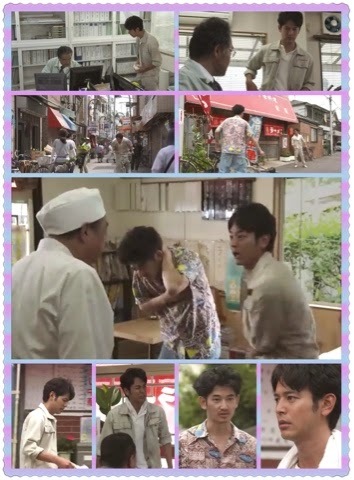 Asahi rode the bicycle and rushed down to pay the bill on behalf of his brother. Feeling frustrated, Asahi threw the bicycle at Satoru and told him to settle down for a job. Satoru mentioned about the bitter secret that could not be resolved so easily. Asahi decided to reveal about the bitter secret tonight. On the other hand, Hikari faced with a heartbreaking news about a premature baby. Both of the parents do not want the baby to receive treatment anymore. Hikari could not handle this devastating situation and Masaomi stayed by her side to console her. All the siblings were present at night, and Asahi divulge the truth behind their father "accident". Actually, their father shouldered the responsibility of a mistake which eventually led to his accident. Their father did not make the mistake that cost his life. The culprit behind their father death was the company that Asahi is currently working at. The boss had then offered Asahi a full-time job at the construction site to compensate the family. The revelation about the bitter secret did not sit well with his siblings. They blamed him for giving up the fight for justice. Satoru even accused Asahi for being self righteous and pretentious. However, Asahi stated that he had no choice but to compromised due to their helpless situation. He declared that he had not done anything wrong to apologize to them, since all of them grew up pretty well. He did not not expect his siblings to show gratitude to him after all the sacrifices that he had made. 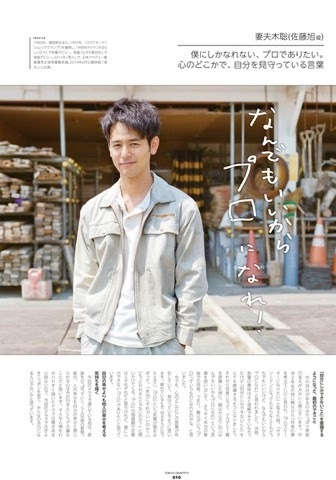 Asahi felt that it was his responsibility as the eldest son to provide for the family in the absence of their father. Asahi felt terrible for getting all the blame from his siblings. He was sitting on the swing alone, while singing his favorite song. A few moments later, Azura gave Asahi a call to cheer him up and he felt energized again. Satoru decided that he has no right to blame Asahi as long as he did not work like his brother. Therefore, he is here to interview for a job at the construction site. Asahi said that it does not matter to him if Satoru will be employed, however that does not prove to be the case. Asahi was anxious to help his brother to fill up the personal particulars in the employment form. The boss came and take a look at the two brothers. He told them that it is not necessary to fill up the form since he had already decided to employ Saturo. Asahi and Satoru awkwardly turned around and tried their best to tolerate the boss unpleasant behavior. They took a few steps towards the door and the boss suddenly jeered Satoru for being an ex-convict. Asahi intended to turn around and confront the boss. In order to avoid trouble, Satoru tripped Asahi over and stated that he is used to people calling him a jailbird. Asahi was furious and pushed Satoru down, stating that this is not something that he should get used to. In a fit of anger, Asahi did a flying kick towards the boss and knocked him onto the floor. He warned the boss not to speak ill of his family members. He revealed that he had being holding a grudge on him since their father's death. Satoru looked on in surprise as he did not expect Asahi to react so strong to stand up for him. Asahi was fired from work and he left his workplace together with Satoru. Both of them sat at the playground and have a heart to heart talk. The troubled Asahi mentioned about his problems, as he will be meeting Azura 's mother tonight. He is worried that since he is jobless now, it will be seen as being incapable to take care of Azura. Satoru listened attentively and reprimanded him for being impulsive. Satoru is back to his usual carefree self as he turned around and walked away. He suddenly turned back and addressed Asahi as his elder brother. After Satoru left, Asahi realized that he had just called him brother after so many years. Asahi went for his house visit after he mustered all his courage. He confessed to the Azura's mother that he is jobless now. However, he promised to try his best to provide for the family. Azura and her mother were calm and composed after hearing the news, and Asahi was puzzled. Asahi gave a formal bow and accidentally knocked his forehead on the table. The mother and daughter laughed at him, stating that Asahi resembles his brother Satoru, especially the way they bow. It turned out that Satoru had visited the family eariler to explain about the incident. He said that they are proud of Asahi as their eldest brother. They owe their achievements to Asahi who had took up the duty to raise his younger siblings up. Asahi was touched by his brother's gratitude and cried. Actually, his siblings appreciate him very much but they do not express their thoughts to him. Asahi cried and Azura's mother offered him a handkerchief. The next morning, Asahi was lying on the floor after having a drink too much. He woke up to the alarm of the TV programme, only to realized moments later that he was already dismissed from work. He decided to cheer himself on and the noise that he made, disturbed Hikari. She walked out of her room with messy hair and instructed her brother to keep quiet as she is sleeping now. On the other hand, Satoru decided to accept the job offer at the field, Kasumi joined Haru acting club as the leading actress, while Tadashi carried a touch on her. At the hospital, a photograph of Hiraki and Masaomi was sent to him by an anonymous person. Who is that mysterious person? I can spend my whole time watching Satoshi , Hikari and Eita acting together in a drama. They were simply the focus of the story and their performance were outstanding as usual. The conflicts between the siblings and how they resolved the issue was interesting. Towards the end of the episode, I was so touched by the strong bonding between Aashi and his siblings. The bitter secret is actually a burden to Asahi. I can sympathize with him, and it is good that he decided to shared this secret with all his siblings. It will take some time for his siblings to soak in the truth and understand his position. Eventually, they will appreciate him for the sacrifice. I respect Asahi character and his strong determination. Even Satoru could not bring himself to work for the enemy. Asahi placed his priority on his family welfare and thought of them before himself. The next episode should be focusing more on Hiraki and Masaomi love affair. Satoru also have some issue with Masaomi, I am quite curious about this hidden secret too. On the other hand, Tadashi and Haru have a crush on Kasumi. What will happen to the love triangle? I am also interested in the ambiguous relationship between Satoru and Takako. Lastly, will Asahi and Azura baby be delivered smoothly? It has been a pleasure for me to watch this Jdorama. Hopefully, the rest of the episodes will be engaging too.